Kemba Walker of the Charlotte Hornets during a game against the San Antonio Spurs at the Time Warner Cable Arena on Jan. 14 in Charlotte. 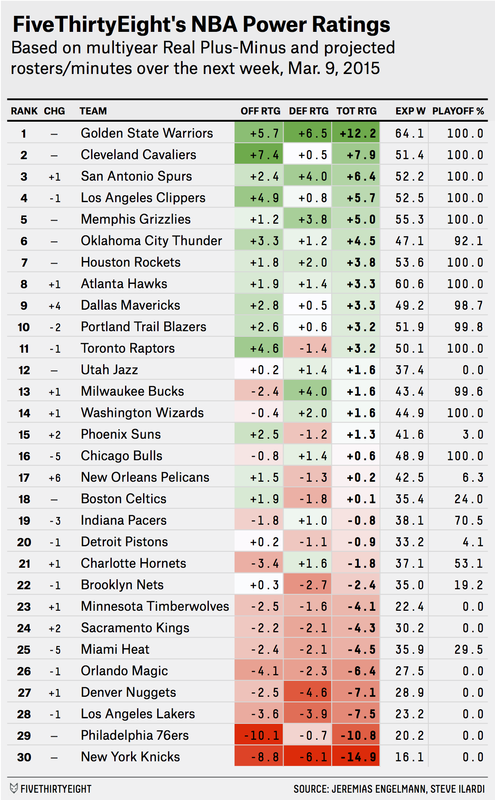 With just about five weeks remaining in the 2014-15 regular season, we present another edition of FiveThirtyEight’s NBA Power Ratings. How do these numbers work? In a nutshell, each team is ranked according to a projection of its strength over the upcoming week — and the upcoming week only — using Real Plus-Minus (RPM) player ratings provided by Jeremias Engelmann and Steve Ilardi. For more details on the methodology, see our introductory rankings post. Don’t look now, but the Charlotte Hornets suddenly have a 53 percent chance of making the playoffs in the East. Winners of six of their last seven games (including five straight), they also saw their long-term talent rating improve greatly with the prospect of guard Kemba Walker returning for the season’s stretch run. A knee injury has kept Walker out of action since late January. The Atlanta Hawks, owners of the league’s second-best record, still rank just 8th in our power ratings. What’s going on? It’s not their loss Saturday to the lowly Sixers, nor is it a disconnect between the team’s winning percentage and its point differential (they rank third overall in Basketball-Reference’s adjusted efficiency differential, so they’ve been winning by margins plenty strong). Instead, the issue is similar to what plagued the Hawks last week: Injury-related playing time allocations are working against them in the short term. This time, FiveThirtyEight favorite Kyle Korver sat out over the weekend and is listed as day-to-day in the injury report, which means more projected minutes for Kent Bazemore. Since Korver carries one of the best RPM ratings in the NBA (+4.5) and Bazemore sports one of the worst (-3.8), any shift in minutes from the former to the latter takes a toll on Atlanta’s power rating. The week’s two biggest risers are the New Orleans Pelicans and Dallas Mavericks, and both boosts come largely because key players are returning from injury. Pelicans superstar Anthony Davis, owner of the seventh-best RPM in the NBA, suited up last week for the first time since aggravating his nagging shoulder injury on February 21, and his presence alone improved New Orleans by 2.5 rating points (to say nothing of the points gained by not having to play his backups as much). For Dallas, the big gains come with Tyson Chandler and Chandler Parsons re-joining the lineup. Our projections expect that pair to play about 54 combined minutes per team game over the upcoming week — an increase of 25 minutes per team game that yields a 1.9-point rating improvement for the Mavericks. They also project to gain 0.6 rating points via decreased minutes for players lower on the depth chart. Since the news of Jimmy Butler’s injury broke too late to be accounted for in last week’s rankings, the full extent of its damage can be seen in Chicago’s power rating this time around. A reduction of 26 minutes per game to Butler’s projection cost the Bulls 1.7 rating points, while big playing-time upticks for low-rated wings E’Twaun Moore and Doug McDermott set Chicago’s rating back by another 1.5 points. The loss of Butler was much more damaging to the Bulls than that of Derrick Rose, whose injury only cost the team about 0.4 points of power rating after his backups were accounted for. The Miami Heat have been hemorrhaging playoff probability for weeks now and are down to just a 30 percent chance of making the postseason despite sitting at 93 percent back on Feb. 2. The team has gone 7-8 since then, while Indiana, Boston and Charlotte — at that time, three of Miami’s chief competitors for the final pair of unclaimed Eastern Conference playoff slots — have gone a combined 28-14. But Miami’s bigger problem is that their talent pool has been drained, even after winning the trade deadline. Highly-rated players such as Chris Bosh, Hassan Whiteside, Luol Deng and prized deadline acquisition Goran Dragic are all injured (or listed as day-to-day), while the team is projected to give big minutes to poor RPM players such as Henry Walker, Michael Beasley and rookies Tyler Johnson and Shabazz Napier.